Turf Hacker: How Much Nitrogen? How do you decide how much nitrogen to apply and when? I have always used research showing the relationship between disease pressure and nitrogen rates as the basis for my fertility program. In general, nitrogen rates higher than 2kg/100m2 per growing season resulted in more fusarium. Fusarium is my number one pest so obviously I plan most of my agronomic practices around prevention of this fungal disease. Once I had the total rates I would basically just divide the total by the number of growing months I had in my climate or 8 giving me a number of around 0.25kgN/100m2 per month. I would then tweak these amounts based on the following growth model for cool season turf. 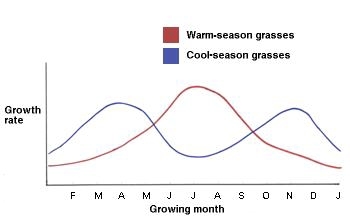 For the most part this growth model is exactly how cool season turf performs in most cool season climates. 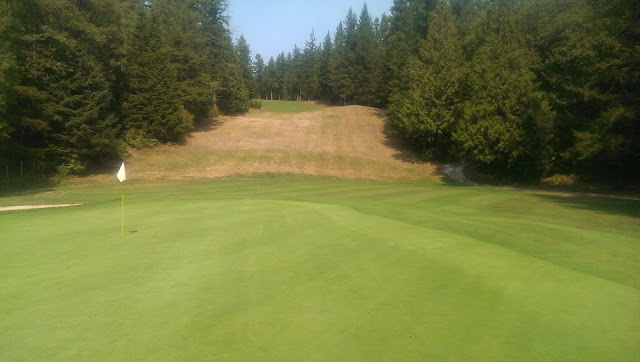 The only problem is that being on the West Coast of Canada I maintain turf in an extreme range of this climate. My climate is extremely not extreme or temperate. It really doesn't get that cold in the winters and in the summers our average temperatures rarely rise over 20C. The only problem for me is that that previous growth model is based on colder winters and warmer summers than I experience in my location. is an extremely not extreme climate! It wasn't until recently that I came across this article by Micah Woods Ph.D. (Asian Turfgrass Center) which shows how the Growth Potential equation, developed by the fine folks at PACE Turf, can be used for calculating nitrogen requirements based on your specific climate. To me this was ground-breaking stuff. I always knew that nitrogen rates should be based on growth rates but it was too hard to for me to figure that out. The resulting data from this growth potential model was amazing. It turns out that in my climate the typical cool season growth model was completely wrong. On the coast we never really got temperatures high enough where the growth rates of cool season turfgrass slowed. 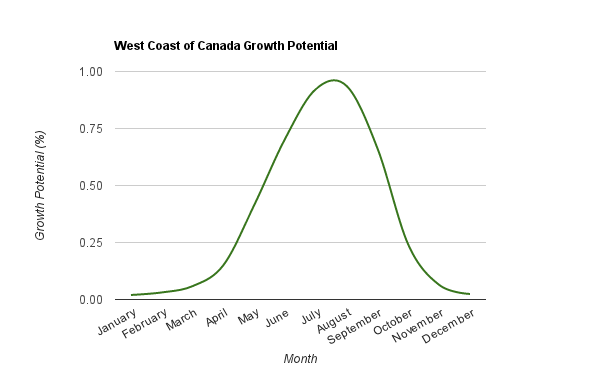 In fact we barely reach the maximum growth potential for most cool season turf species in our climate. In our warmest month (August) we only reached 94% of the growth potential. It turns out that in my climate the growth rates more closely resemble those of warm season turfgrass. Cool! Dr. Micah Woods has been doing some really interesting research lately regarding turf selection based on climate as well as turf nutrition. I highly recommend checking out his blog for the latest and greatest information in the fields of turf nutrition and selection. Personally I feel that this kind of work is really forward thinking and important for the turf industry. For too long we have been forcing turf to grow where it's not best suited. Furthermore we have been creating a whole string of problems by not fully understanding turfgrass nutrition and soil science. Again, check out what he is doing, it is focused on warm season turf but it all applies to cool season turf as well. I have a hunch that he is going to post a lot of really cool data in the next few years. I can only hope and pray that he eventually does some cool season climate comparison work similar to the stuff he has already done for warm season turf (nudge nudge, wink wink). Recently I was contacted by Micah, knowing that I closely monitor growth rates and have recently switched to the growth potential nitrogen model, who requested some of the growth rate data that I had been collecting over the last year. He wanted to compare growth rates with average temperatures and nitrogen application rates. The resulting chart clearly shows that the growth rate of my putting greens is more closely related to temperature and less so on nitrogen rates. Growth rate is measured in Baskets/day on my greens mower. Data Compiled and Charted by Micah Woods Ph.D.
You can clearly see that in the Spring of this year I was applying a higher amount of nitrogen to my putting greens than August but the growth rates were still less than they were in August. It wasn't until June that I switched my nitrogen rates to the growth potential model. 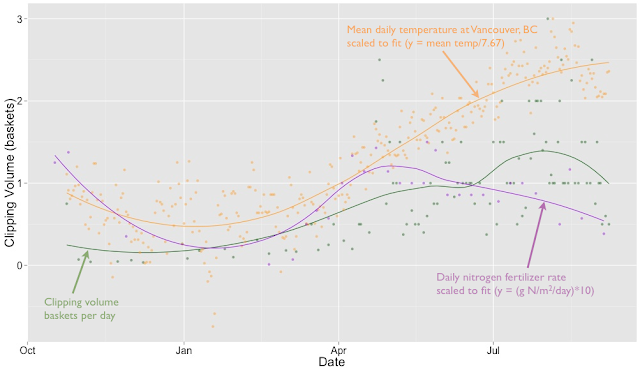 Even though my nitrogen rates dropped slightly you can see that growth rates continued to climb along with the average temperatures. I can't wait until next year to see how the data compares and the turf performs. I have a hunch that all three lines will be similar but who knows. Recently I've had problems with equipment breakdowns and haven't been able to adequately fertilize my putting greens as can be seen at the end of this chart. Data collected over the next year will more clearly show the slowed growth rates this fall. We also discussed the different ways that turf managers have historically applied nitrogen. Until recently I had basically applied nitrogen at a constant rate throughout the season. This is typically how most turf managers apply nitrogen. Sure we tweak here and there but for the most part it's not that different. This method can produce great conditions but is it the best way? The whole environmental movement recently has really focused on reducing inputs and only applying to the course what is actually needed. This growth potential model is an excellent tool for figuring out how much N your turf needs and avoids wasted applications. Remember, the amount of nitrogen that the plant is able to use is dependant on the temperature, not necessarily how much you throw on. It should be really interesting to see how this theoretical nitrogen use will apply in the real world over the next few years. Maybe higher nitrogen rates on the potential could be beneficial especially during spring green-up. Again time will tell. Again it's almost fall and I can't wait until next spring! The following chart shows growth rates on my putting greens over the past 3 weeks. The soluble nitrogen applications are pretty obvious. At first we see a spike in growth but the growth rates quickly return back to normal a few days post application which is to be expected with 100% soluble nitrogen. Of course the magnitude of this growth spike can be managed by applying slow release fertilizers or soluble fertilizer in light and frequent applications like I do. This growth spike is one of the main reasons I use a 100% slow release nitrogen fertilizer on my fairways. I don't have the luxury to apply fertilizer light and frequent on my fairways. This 100% slow release virtually eliminates the growth surge following application. Soluble nitrogen is often used for quick growth surges to recover from damage or cultural practices like verticutting and aeration. The above chart really makes this point clear with the quick growth surge often only one day post application. What is important to note is that after the quick surge of growth the typical growth rates resume based on temperature. I would really like to see data from putting greens maintained with partial slow release N and 100% slow release N.
The main benefit that I see from using the growth potential model is producing a healthier plant. Since switching over to this fertilizing method I have seen a huge improvement in my turf health which can't be seen on any of the previous charts. Typically during the summer months I would reduce my nitrogen inputs as this is what I was taught to do. The only problem for me was that in my climate this is the wrong thing to do. Dollar spot is a big issue on putting greens in the summer and it can be successfully controlled with timely nitrogen applications. I have to say that a big part of my dollar spot control success this summer was due to the increased nitrogen rates. I also hypothesize that the reduced nitrogen rates in the spring and fall could have an effect on fusarium incidence. Another benefit of using the growth potential model as well as monitoring actual growth rates is the ability to monitor the turf's ability to handle stress. Managing turf stress is key to reducing pesticide inputs and in producing good healthy turf. I can now easily see when my turf is able and not able to handle stress and I can change my maintenance practices to better suit this. There is no point in me applying a ton of nitrogen to help the turf fight disease if the turf doesn't even have the ability to effectively use it. Going into this fall I now have a really good idea of when I can use certain aspects of my fusarium management plan and when I will have to rely on other aspects. Even another potential benefit of using this model is thatch reduction. By minimizing nitrogen inputs and matching them to their use potential there could be a reduction or no net gain of thatch. I really look forward to any research that is done on this topic in the future. It has been a very enlightening year so far in regards to putting green fertility. Basically everything I leaned in college 8 years ago has been thrown out the window. I am now using the MLSN guidelines and have based nitrogen inputs on the growth potential for my climate. I have to say, this new way of doing things is working a lot better than the old way. I have cut my fertilizer budget by 60% and have drastically increased the quality and health of my putting surfaces. Almost all guesswork has been eliminated and I can make fertility decisions with confidence. A big thank you to Micah Woods for coming up with the idea on how to use the data I had collected. When I first stated collecting growth rate data I had no idea how interesting and useful the results would be! I really look forward to his research on the subject. And you thought I was kidding when I said I'd let the rough burn out.